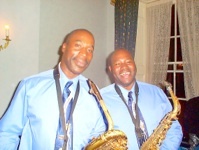 Calvin & Tony a Saxophone duo born to Entertain. Available for Hire: Weddings, Birthdays, Corporate Events, Café Bars, Restaurants, Barmitzvah’s Etc. We have provided wedding entertainment in over 100 venues across the country. Including: Shrigley Hall, Stanley House, The Hilton Hotel and the Great Hall at Main. We have also undertaken numerous private and hospitality functions. Most of our functions are private weddings and drinks reception.